Visiting Venice for the Biennale, we each end up finding our individual trajectories through its myriad narrow streets and along its blue green canals. There are merits to getting lost beyond the bustling Giardini and the Arsenale. Accept the inevitable dead ends, and sometimes an off-piste excursion can reveal hidden gems. Scattered throughout the city there are many collateral events. 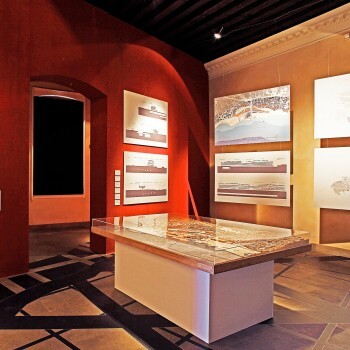 A short vaporetto ride from San Marco square, on the Island of Giudecca, next door to the Bauers Palladio Hotel is the Zuecca Project Space, showcasing The Yenikapi Project, a collaborative exhibition by Peter Eisenman and Aytac Architects, which focuses on their recent work in Istanbul. The Istanbul we see today has been thousands of years in the making, yet much of its contemporary development is controversial and lacks sensitivity to the city’s ancient roots. The Yenikapi Transfer Point and Archealogical Park demonstrates an alternative model for contemporary building in the city. The Eisenman/Aytac scheme is complex and gives considered treatment to it’s historic context, shaping itself around the newly uncovered archaeology. The site is uniquely positioned to reveal the layering of human history in Istanbul. With the architectural drama arising from the collision of the future and the past in a way which could scarcely be more apparent. The project evolved in the years following the discovery of archaeological sites during the construction of a major underground railway station. Preserved in mud of the Byzantine harbour, thirty six shipwrecks, and artefacts from Neolithic through to Roman times. The finds all telling of the changing habitation of Istanbul. Peter Eisenman, who personally designed the exhibition, draws references to the host city, Venice, and invites comparison with Istanbul. There are obvious similarities between the two, however their differences are more profound. Whereas Venice has rigorously preserved its history, and remains, save for the biennale, almost untouched by modernity, Istanbul is throwing itself headlong into the twenty-first century. The expansion of the city is a vital, contradictory affair which promises to make it an ever more remarkable place. Eisenman’s message here is that contemporary architecture need not be the destructive force it is often perceived to be; rather it has an important role in strengthening and deepening the relationship we have with our history. On our travels – as when we turn the pages of Italo Calvino’s Invisible Cities – we come to understand the historic reveries common to all urban environments. In a similar way the Biennale which Rem Koolhaas has curated, is also a forum for discovery where everyone will come away with different opinions. With simply too much to see, and unable to absorb it all in its entirety, we must discern our impression from our accumulated glimpses. With a succession of disparate chronicles, the layers of narrative enrich but do not approach objectivity.